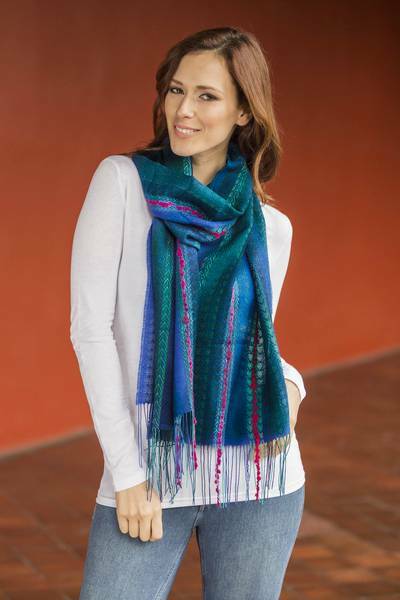 Woven Baby Alpaca Blend Scarf from Peru, "Altiplano Sky"
This is a strikingly beautiful scarf with vivid colors. Warm but not too heavy. The blues of this scarf are so perfect! It is soft and drapes beautifully. It feels warm but not hot. This elegant scarf is a great way to accessorize a coat, sweater, or dress. I'm very proud to wear it and to tell everyone where I got it. It really is outstanding. "Unique scarf! Beautiful woven craft"
The colors which make up this scarf are just stunning! The weaving is open and varies from fine to coarse, which adds to the visual appeal!